When I started on this adventure at age 84, I had serious doubts whether I could still do this sort of thing. After all, it had been 44 years since I did any piloting. 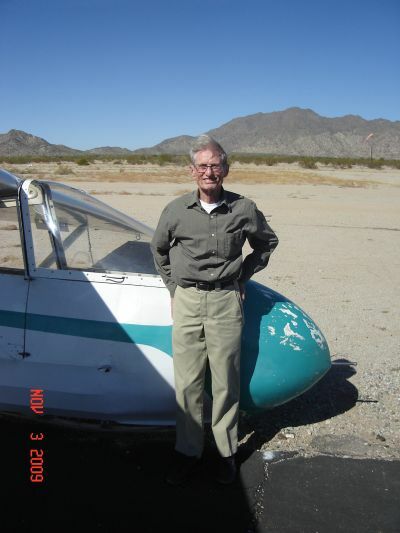 First I had three rides at a soaring club, with the intention that I would become a member and get "checked out." But they had only one instructor, they fly only on weekends, and the numbers ahead of me grew from one to seven by reason of other members returning and claiming their place in line. So I went to Arizona Soaring, Inc., which is located about 30 miles southwest of Phoenix, and began flying there on October 4th, 2009. I think it took me longer than it would for a young person, but it wasn't bad. My total logged glider time when I finished the Practical Test was 6 hours and 33 minutes. But because it was not good soaring season, the flights were very short, and I had 47 flights, including 15 solo, in that length of time. Some flights were only for about 5 minutes. During training, there were some special tasks, each of which was done twice. These included takeoff with no wing walker (in other words, the wing tip wheel dragged on the ground until we got enough airspeed to level the wings); simulated rope break, where the instructor unexpectedly pulled the release cord at or slightly above 200 feet; emergency release from tow; and a forward slip on landing approach. The instructor did not demonstrate these items - perhaps because I was already an experienced pilot. Except for a period of absence, during my training period I flew three days per week, average four flights per day. This is the Operations Building at Arizona Soaring. They have a hangar on the other side of this, where all their aircraft are stored at night. This view is looking northwest, and the runways are off to the right, such that a person in the office can see and record takeoff and landing times. This shows one of the tow planes, and the general position for towing. The towline is 200 feet long and has a specified breaking strength. They use a paved runway for takeoffs and two unpaved runways for landings, In addition, there is a "bypass" runway for the returning tow plane to get around gliders waiting for takeoff. I tell prospective passengers, "You'll be hauled aloft by a tow plane on the end of a 200-foot-long rope, in an aircraft that has only one wheel for takeoff and landing, and no engine for the situation where the pilot doesn't like the landing approach." That's what's so sporty about this! A closer view of a tow plane, showing the towline. Arizona Soaring has at least four of these trainers. Here two of them are secured to the ground to prevent gusts from damaging them. They also have some high performance gliders, used both for demonstration and instruction, and a few people store their own gliders on the field, using the facility only for towing service. A tow plane is parked at the refueling station. Soaring is a wonderful sport -- clean, harmless and challenging. Everyone I've met here is friendly and competent (including the dog who sometimes helps with the towline), so I enjoyed every bit of it. 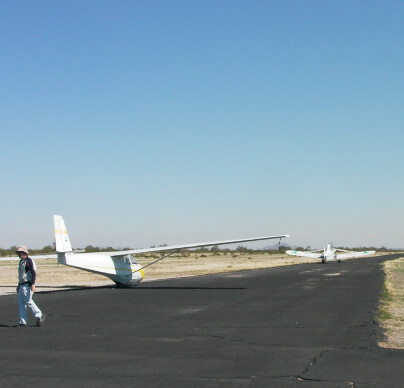 In this photo, the tow plane has started the takeoff run, and the glider nose skid is just getting clear of the ground. It takes only about 15 seconds to get airborne. The man walking away is my instructor, Bruce Waddell. Notice that the glider has the left wing slightly low. That's to counteract a crosswind from the left. In effect, it's "leaning" into the wind. If the pilot can find some thermals, one can stay up indefinitely. We had a day of fun! On December 2, 2011, exactly two years after my first FAA practical test, I had my first biennial review, which was three flights plus oral review. This is done with a certified flight instructor and is recorded in the applicant's log book. Highlight of the day for me was having the instructor pull the tow release cord at 200 feet above ground (simulated rope break) on the climbout. That requires quick action with an "aggressive" turn around to land downwind. Really sporty! 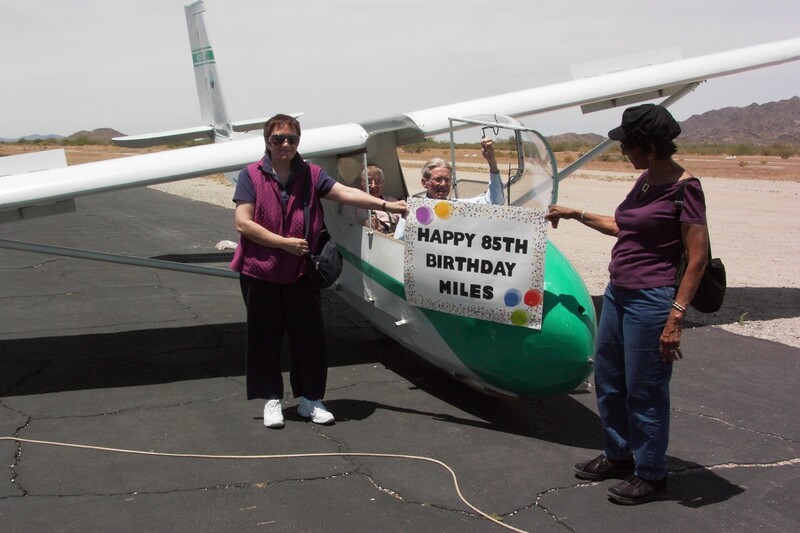 On March 29th, 2012 my wife, Lea and my granddaughter, Diana and I went flying to celebrate Lea's birthday for 90 years. Diana took these pictures from the back seat. This picture is shortly after takeoff, with altitude about 50 feet above ground. Here we are about 3,000 feet above ground (the altimeter is obscured, but we can tell from the white spot on the mountain), still hooked up. We released from tow at 4,000 feet. Diana took several pictures of herself in the back seat, as well as all the other pictures of this day. Here we are about 4,000 feet above ground, looking down at our airfield, with the tow plane hauling another glider aloft. There were several other gliders in the immediate area. Soaring conditions were good that day. We stayed up for an hour, and came down voluntarily so we could make some practice takeoffs and landings. At this point, about 600 feet above ground, we're about to start our turn onto final approach. Turning onto final approach for landing. We will land on the unpaved strip to the right of the paved runway. While it's easy to make a safe landing in a glider, the big challenge is to judge all the factors so as to land and stop just where you want to. The third and final flight of the day was solo. Here we are about to have the towline connected. For me, this was Glider Flight #100. Flying around like a buzzard on thermals. The noise is from the slipstream. When the sun shines on the instrument panel, you can see that the variometer is usually showing that we are gaining altitude. The dirt runway is not smooth. Solo Takeoff with crosswind (Flight # 100) Only the first few seconds of this are worth watching, because it quickly goes out of sight. Notice what happens when I close the spoilers close to the ground. The end of a highly satisfactory day. From left to right: Miles, Diana and Lea. As of 2012, I don't yet have much experience with actually soaring, but in May I did climb to over 10,000 feet. In May of 2016, just a couple of days before turning 91, I spent two days trying to regain current status with a degree of proficiency, but it seems that I'm no longer able. Goodbye flying!